The inspiration for the organization began forty years ago, when Dr Dian Fossey was studying her favourite gorilla, Digit, aided by a student volunteer called Ian Redmond. 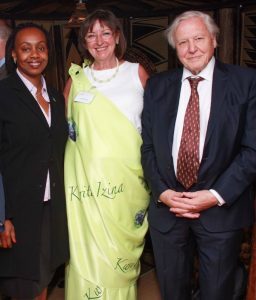 It was Ian who discovered in 1978 that Digit had been killed by poachers; this sad event inspired Sir David Attenborough and Ian Redmond to establish the Digit Fund to finance Dian’s anti-poaching patrols and prevent further poaching of mountain gorillas. In 1988 the whole experience became the subject of the film Gorillas in the Mist, with Ian as primate adviser and starring Sigourney Weaver. In 1992 the fund was renamed the Dian Fossey Gorilla Fund International, with Ian as Chairman and Jillian Miller as Director. Jillian has experienced numerous dramas in her twenty-five years of continuing Dian’s work: these include smuggling a fleeing vet to safety during the genocide in Rwanda; being held at gunpoint by a Congolese warlord; and coming face-to-face with armed poachers. Her high moments have included working closely with the late Douglas Adams, holding a fundraising concert at the Royal Opera House with Bryan Adams and Joe Strummer, and being kissed by Leonardo DiCaprio! Better still is the sheer delight of knowing that her work is transforming people’s lives in Africa, helping women to grow food and bring solar power to remote villages, and ultimately giving people the resources they need to defend their own local environment. The charity’s work centres around gorilla habitats in Uganda, the Democratic Republic of the Congo (DRC) and Rwanda. Dr Samson Werikhe and Henry Cirhuza, the two East African Programme Managers, are both experts in conservation. In 2003 the charity was approached by village elders in the DRC to help them form a community gorilla reserve to protect the 700 eastern lowland gorillas, which they believed were living within the forest. 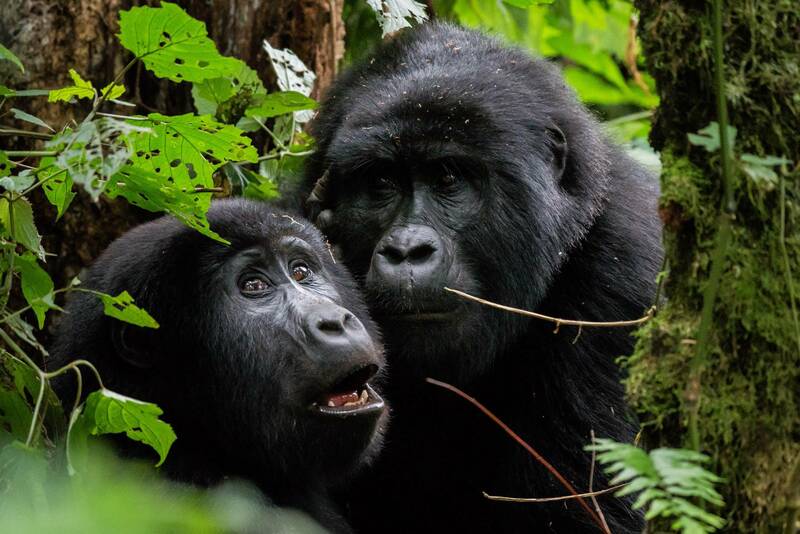 The charity now manages 33 local park rangers who regularly track and monitor the gorillas, also providing information on other species in the forest such as chimpanzees, leopards, guenon monkeys and red river hogs. Other important tasks for the rangers involve removing snares and traps set for bush meat; their success is evident from the reduced number of snares now collected by the team. A strong community outreach element includes meetings with village chiefs about the impacts of hunting and resource gathering in the forest, and screenings of an environmental documentary reaching over 10,000 villagers. The charity pioneered the now widely adopted practice of community conservation: the concept that the human neighbours of wild animals should be treated as partners rather than enemies of the animals. Treating them as partners encompasses investing in the education of their children, incorporating environmental knowledge, making agricultural land, seeds and training available to the community and training bee-keepers to share their skills. All these initiatives have helped reduce potential disturbance to gorilla habitats. As internal migration in the DRC has caused local populations to rise, forests have been disappearing at an alarming rate. In 2015 many people died in landslides in the Kalehehe area, caused by deforestation. The Gorilla Organization’s response was to plant 2.5 million trees in between the two national gorilla parks of Virunga and Kahuzi-Biega. Fast-growing trees provide dozens of communities with a sustainable supply of timber and fuel, while mango and avocado are grown for food. There is now a natural green buffer between the farmers and their gorilla neighbours.